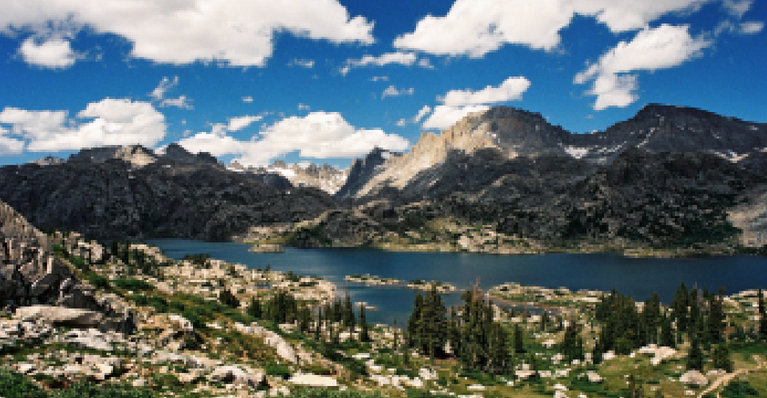 Newcomers to the ranch are frequently overwhelmed with the beauty and expanse of the Bridger-Teton National Forest. We can explain how we are nestled amongst five distinct mountain ranges on the continental divide and that our wilderness sanctuary is rife with outdoor activities. We can say you’ll find pristine watersheds, abundant wildlife and immense wildlands and the forest comprises a large part of the Greater Yellowstone Ecosystem – the largest intact ecosystem in the lower 48 United States. All of that is lost when people see it for themselves. Still, we’ll try to help you understand what awaits you on your visit with these interesting facts. Our ranch sits at the western base of Togwotee Pass where we can clearly see the Tetons glow with the day’s first light. 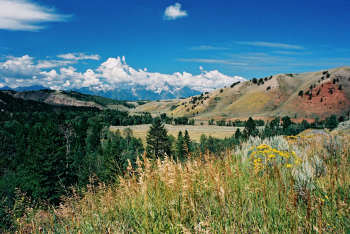 The rugged peaks of the Absaroka Range rise over the ridge to our northeast and the majestic Wind River Mountains abound from Togwotee Pass for 100 miles to the southeast. As we look at the Tetons, around the corner is where the Gros Ventre and Wyoming Ranges begin. Teeming with opportunities for discovery, adventure, escape and memorable summer siestas, prospects abound at the ranch. One more thing – when you’re having that glass of wine at night on the cabin porch, don’t forget to look up. The night sky here is something to behold. The beauty of this region didn’t happen by mistake. It’s been part of a hard and deliberate process that began in the 19th century when Presidents Harrison and Roosevelt made proclamations to set aside land in reserve. 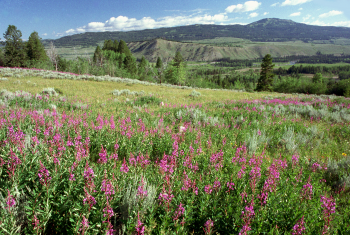 Roosevelt ultimately created legislation to designate national forests, leading to the Bridger-Teton National Forest. rs became prime areas for beaver trapping. Soon after, numerous expeditions were launched to examine the economic viability of the area. Cattle ranchers and settlers were not far behind. The forest was a major contributor to construction of the transcontinental railroad. Beginning in the middle of the 19th century, timber cuts throughout our forest produced millions of railroad ties. This process, known as tie hacking, continued well into the 20th century. It wasn’t all about extracting natural resources from the land. Early conservationists focused on appreciating the landscape as it stood. Early mountaineers Paul Petzoldt and Glenn Exum made history on the Grand Teton. Pioneering photographer William Henry Jackson created the first images of our mountains that motivated Presidential proclamations. Ansel Adams shot many of his famous, iconic images in our valley. Today, our visitors can see the natural wonders of the forest at their leisure and feel the history around them. It would take a lifetime to explore every trail, stream or settler’s cabin, but it’s a pursuit that we all can enjoy.